Hello. I continue to enjoy your hash table updates! I use TommyDS with statically allocated memory. Does TommyHash performance benchmarks hold true when not doing mallocs? I don’t have a benchmark designed for your use case, so I don’t know. 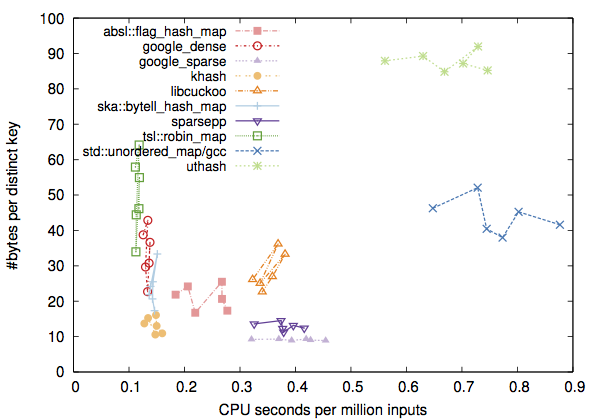 Generally, if the hash table only holds pointers to data stored elsewhere but not data themselves, the performance difference between various hash table libraries will become smaller. As to tommyds, it uses chaining. In all the other hash table benchmarks I have seen – none of them evaluated tommyds – chaining is generally slower than open addressing. I don’t know why tommyds is different. In addition, tommyds uses old libraries. Khash for example should be ~2x as fast since 2013. Other 3rd-party libraries are old, too. Looking at the source code, I also think it looks a bit weird in that it adds keys as values at the same time, probably because not having a concept of keys vs values, tommyds is doing that anyway. If I were to implement this benchmark, I would do it differently for khash and google dense. Did you have a look at SharedHashFile on github? Do you have a multi process benchmark to take advantage of SharedHashFile? It seems to me that SharedHashFile is designed for a very different purposes. It is better compared to other key-value stores. Do you have some recommended books about C/C++ programming, hash tables, data structures, algorithms and related fields? Sorry, I don’t have good suggestions. The programming books I read were in a foreign language and were very old. For advanced topics, I mostly learned from others’ blog posts and sometimes published papers in computer science. Good info. Thanks for the post. I’m wondering if radix tree would be better for detecting unique integers of a maximum bit-width given directly indexed look-up tables are cheaper and faster? I suppose it will depend on how the input stream of N integers is distributed. With a hash table, you can usually find the key in a couple of jumps with one cache miss. I doubt you can achieve the same with a radix tree unless the input is sorted in the right order. In addition, a hash table is dynamic. A dynamic radix tree will be probably even slower. Using realloc there is kind of a cheat, I’d love to show you how much so. I made a hashmap too and while being around 2x slower than khash it uses about 25% less memory. I could easily fit in a realloc into my hashmap implementation, but not all data is relocatable and c++ allocators don’t support relocation therefore it’s kind of cheating and that’s why it’s sadly not there, but let me know if you’re interested! Very nifty! One suggestion: If you’re comparing single-threaded / non-concurrent-safe implementations against Libcuckoo, we recommend using the locked_table variant, which avoids some of the overhead in the table that’s added to make concurrent modification safe. I’m interesting in keeping an existence-only style table of pointer keys (i.e. I only care if the pointer is in the table, not what it’s value is). I want to implement a clone() type function generator using this. Is khash/open addressing suitable? If you store pointers in a hash table, open addressing still works. Open addressing doesn’t work when you store entire objects in the hash table and reference the objects with pointers elsewhere. This is because the addresses of the objects in the table may change. 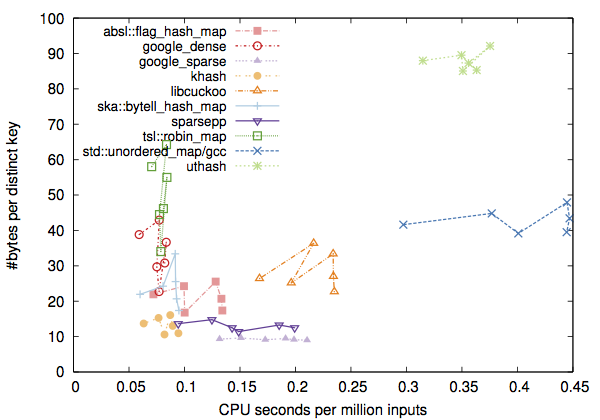 Nice benchmarks, although I would’ve loved to have GLib’s GHashTable in the lineup too. It’s used extensively in the GNOME desktop stack and system-level services like NetworkManager, so it’s relevant to a whole lot of Linux users. Good work on khash — it’s simple, compact, frugal and very fast.